Hardcover, 8 x 10.5 in. / 72 pgs / 31 color / 3 bw. 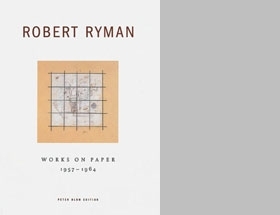 The works in this exhibition catalogue record the time when Robert Ryman, then in his early twenties, was formulating his disciplined approach to painting. 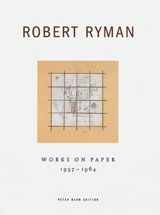 On off-white and translucent materials including wallpaper, a circular coffee filter, newsprint and mylar, Ryman drew, tooled, brushed and pressed his marks using a flat table to support the work. His decision to use the square as a consistent format for non-narrative work was set, and while he sporadically used color in these earliest works, he subsequently chose white almost exclusively in the process of eliminating all that was superfluous to a painting. Edited by Christel Sauer. Text by Urs Raussmüller, Meret Arnold. FORMAT: Hardcover, 8 x 10.5 in. / 72 pgs / 31 color / 3 b&w.